Ancient Eastern religions have something to teach us about interacting with the environment, says the organizer of a recent UC Santa Barbara conference on religion in China. Yang says that instead of viewing humans as superior, Buddhists believe we should see all living beings as part of a whole. The two-day International Conference on Chinese Religio-Environmental Ethics and Practice welcomed cultural anthropologists and historians, from as far as China itself, including Dedong Wei from Renmin University in Beijing. The conference was sponsored by the UC Santa Barbara Confucius Institute. An array of speakers touched on environmental issues such as the extinction of animals and how traditional Chinese religious cultures view them. Panelists spoke about religious rituals like making trees and forests sacred, the care of animals, preserving sacred sites and native places, and the ethics of these religious practices. Wei, a religious studies professor, presented his work in a panel about caring for animals, discussing his paper “Releasing Animals for Buddhist Merit in the Context of Science and Ecology.” According to Buddhist beliefs, says Wei, “If you often release animals, you will eventually live longer.” Animal releasing in the practice of Buddhism is when people set animals free from harm or entrapment, such as slaughterhouses or fishermen’s nets, as an act of compassion. The good karma attained from this act is believed to give the person relief in their life or potentially a prosperous afterlife. Professor Dedong Wei from Renmin University, sharing the importance of animal releasing in the practice of Buddhism. But “animal releasing” is not what it seems. Wei revealed that, ironically, capturing wild animals to release them back into nature often leads to animal cruelty and a high rate of animal deaths. Often these wild animals were not in danger in the first place, but are put in danger from being released in an unfit environment or being unintentionally mistreated before their release. Some individuals may believe they are leading these animals to better health, but are merely capturing them to release them for their own moral gain. Wei added that religious practices like these affect the environment by endangering species that were not at risk before. 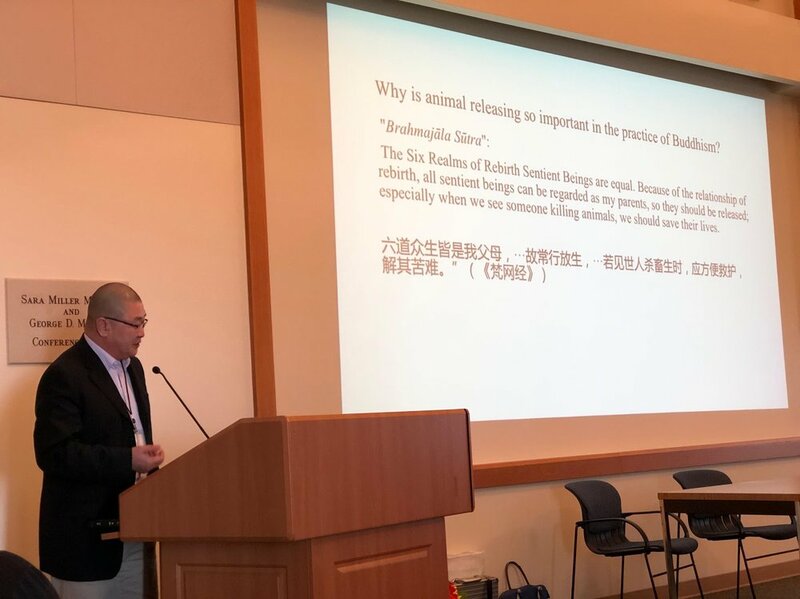 Wei then described a rational, more compassionate way to handle animal releasing, while still preserving the Buddhist tradition, and cited a collaboration between the Grace Gratitude Buddhist Temple in China and animal rehabilitators in New York. By working together, Buddhists from this temple were able to continue generating merits within their faith tradition through healing and releasing animals legally via licensed professionals of the New York City Turtle and Tortoise Society. This collaboration created a bond between science and religion, sticking to traditional Buddhist rituals while carrying them out more humanely. UC Santa Barbara’s Yang, who hosted and spoke at the event, said the conference allowed experts to “focus on what traditional Chinese religious cultures have to say about what us contemporary people deal with when it comes to environmental issues.” Many might not understand the purpose of Buddhist practices, but the insights each speaker offered showed that adherents of these traditions are aware of the possible repercussions. The conference put Chinese religious culture in the context of the world’s environment and how it may be affected by religious practices that are still carried out today. The biggest accomplishment of the conference was “having China-based scholars from different parts of the world bring more communication and interchange to our campus,” Yang said.